Recently a dear priest gave a homily on St. Elizabeth of Portugal. She was the great-granddaughter of St. Elizabeth of Hungary. Like the other Elizabeth, through marriage, she became Queen of a country different from her own. She did all she could to keep peace between her son and her husband, between family and nations. Father reiterated, “She was not a virgin nor religious; she was a mother.” When he said, “she was a mother,” I felt, “be a peacemaker.” But what is a peacemaker? ‘Enemies of peace’ need to be exchanged with ‘friends of peace’. The enemies of peace are anger; ignorance of a person’s plight; ignorance of the world’s plight; desire for profit; lack of respect for life; self-absorption; disinterestedness in the true meaning of work; and misunderstanding the value of marriage and family. On the contrary, peacemakers love; take family seriously; promote the common good; educate in lofty values; defend the innocent and poor; promote human life and value the family. They forgive; reconcile; share goods; work for unity; avoid revenge; and avoid unnecessary war/arguments. As I reflect on the lists, and recall the life of St. Elizabeth of Portugal, I begin to see a peacemaker as someone who brings together two opposing sides for reconciliation. Christ is The Peacemaker and His Sacrifice the Greatest Act of Peace. “Behold, the Lamb of God who takes away the sins of the world!” Christ lifted up at every Mass is the same event of Christ on the Cross, held between heaven and earth, draws all to Himself. This is the ultimate coming together of two sides in the reconciling of sinners to God. If His greatest act of peace was His Sacrifice, where did He begin His work of peace? It was in the family…specifically in the womb of His Mother. The family is essential to fostering peace in the world. But Pope Benedict also told the world that peace is a slow process. He advises us all to create an atmosphere of respect, honesty, and cordiality through our thoughts, words and gestures. We need to remember that we should “feel the need of others as our own” and not tolerate them, but LOVE them. 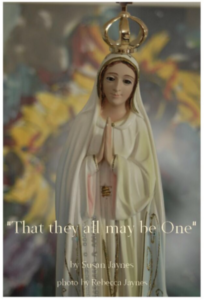 He wisely states peace “depends above all on recognizing that we are, in God, one human family.” It is no coincidence that he wrote this message on December 8 of 2012 (Feast of the Immaculate Conception) and gave the speech on January 1, 2013 (Solemnity of Mary, Mother of God). Why? Because the role of the mother is pivotal to the establishment of peace in the home and in the world. “Thy will be done” equals peace of heart. When Mary was spoken to by the angel Gabriel, a life was offered to her that could easily instill every anxiety. Instead, she abandoned herself to God’s will, then hastened to assist her cousin Elizabeth. She trusted, then went about her duty. What she did is what the saints call abandonment. Abandonment is an attitude of detachment. It is a spiritual gift which we are told to ask the Holy Spirit to give us. In Searching for and Maintaining Peace by Father Jacques Philippe he writes, “The measure of our interior peace will be that of our abandonment, consequently our detachment.” And “if we leave God free to act in His way, He is infinitely more capable of rendering us happy than we ourselves are, because He knows us and loves us more than we can ever know or love ourselves.” What happens when we do not allow Him to act freely? Anger, self-absorption, disinterestedness, anxiety, and all the enemies of peace grow. Therefore, let us to pray for this grace and read books written by the Saints on abandonment to God. Since allowing God to work freely fosters peace of heart, and we are the heart of our homes, learning to say “Thy will be done” is important to our growth in holiness and becoming peacemakers. Where can we being? With Mary, of course! The Heart of the Mother desires peace for her family. It was in the midst of World War I, 1917. Europe was losing the lives of many young men. The century of wars was in full force. Our Lady reached out to the world through three little children. The horrors and threats were beyond the understanding of the poor shepherds of Fatima, Portugal, yet their hearts were open to her message. Are we? The Angel told them to “believe, adore, hope, love” God. Offer prayers and sacrifices constantly to the Most High. Accept all the sufferings God wills for you. Make everything a sacrifice for the conversion of sinners. Do not offend the Lord our God anymore because He is already so much offended. God wants to establish in the world devotion to my (Mary’s) Immaculate Heart. Pray, pray very much and make sacrifices for sinners. Pray the Rosary every day in honor of Our Lady of the Rosary, in order to obtain peace for the world and the end of the war, because only She can help you. Peace is unity with God. It should come as no surprise that Mary, Mother of the Church and Queen of the World, would teach us how to obtain peace in our hearts and our world during this modern age. She shows us that the Christian mother’s vocation is pivotal in promoting peace and she wants to help. Peace begins with conversion, and conversion requires sacrificing our desires for God’s will and the good of all souls. So by following her example we will first say “yes” to God’s will, and then “make haste” to serve and foster unity. In a nutshell, peacemakers aim to answer the prayer of Christ in the Garden when He prayed for His disciples saying, “That they all my be One, as you, Father, and I are one.” Hence, peace is oneness with God. Moms are peacemakers when we work for this unity. It all begins when we ask what Lucia asked Mary 100 years ago, “What do you want of me?”, then hasting to serve our families in peace. I encourage you to take full advantage of the indulgences (see the link below) given during this 100th Anniversary of Fatima. And pray the Rosary every day. I have been a wife for 22 years, am a mother of three great kids, and a Catholic convert for 20 years. I am blessed to homeschool my two teenage daughters, now for almost five years. I live with struggles of anxiety disorder, constant fatigue, and food difficulties which were worsened by my previous illness with Lyme Disease. These opened a path for me to learn from God what real motherhood, simple life, and silent prayer really are. God has been very good to me. I owe Him All.